Built around the need for increasing amounts of data storage, sharing, and multimedia processing, the TS-451+ 4-Bay Home and SOHO NAS Server from QNAP provides a high-performance scalable storage solution for professional users. The TS-451+ runs the QTS 4.2 operating system and provides all-in-one server functionalities as well as features including Virtualization Station, which allows users to run multiple Windows, Linux, UNIX, and Android-based virtual machines. It is also able to operate multiple isolated Linux systems and download containerized apps with Container Station, play 1080p videos and multi-channel audio via HDMI, transcode Full HD videos on-the-fly or offline, stream multimedia files via DLNA, AirPlay, Chromecast, and Bluetooth, search efficiently using Qsirch, use the UX-800P expansion enclosure to increase the NAS's raw capacity, and more. The TS-451+ is powered by a 2.0 GHz Intel Celeron Quad-Core processor that features a boost speed of up to 2.42 GHz. The built-in 2GB of DDR3L RAM, which may be expanded up to 8GB, and the 512MB of flash memory allow quick access to frequently-used files and programs. Network connectivity is achieved via the 2 x Gigabit Ethernet ports. A variety of RAID modes are also supported, including RAID 0,1, 5, 5 + hot spare, 6, 10, which offer data redundancy, speed, or a combination of both. There is also the option to set the TS-451+ in single disk or JBOD mode if you don't need RAID functionality. This 4-bay enclosure has the ability to natively house both 3.5" or 2.5" SATA III & SATA II hard drives or SSD drives. To support both drive formats, screws are included to accommodate both drive sizes. Read speeds can reach up to 225 MB/s and write speeds can reach up to 224 MB/s, while data transfer speeds with AES 256-bit encryption can reach read speeds of up to 204 MB/s and write speeds of up to 158 MB/s. Using the two USB 3.0 and two USB 2.0 ports, this QNAP can be connected to other QNAP devices, such as the UX-500P and UX-800P expansion enclosures, as well as other external drives. The TS-451+ operates using a 90W power supply that operates using 100-240 VAC. It is compatible with Windows, Mac, Linux, and UNIX. Included are two Ethernet cables, a power cord, an AC adapter, sixteen 3.5" HDD flat head screws, twelve 2.5" HDD flat head screws, and an IR remote control. Box Dimensions (LxWxH) 12.6 x 12.0 x 9.9"
TS-451+ 4-Bay Home and SOHO NAS Server is rated 4.0 out of 5 by 7. Rated 4 out of 5 by Lawrence from Good NAS replacement Jus getting this unit. Longer use and testing will tell more. This unit is replacing an older two bay Netgear. Needed more space. Plus I have it raid 5 to protect data. Older unit was only mirrored. So far, so good. There are many apps you can launch for different processes from backups to surveillance camera DVR. I only have a base config right now, plan to use several of the apps in the future. I like the control of users and permission settings. Rated 3 out of 5 by Greg from Good product but difficult to get real support from QNAP Purchased this device so that I could have a backup of important files as well as accessing these files while outside my home network. The device itself does seem well constructed. However, the biggest issue is getting it setup to even work in the first place. It's now been nearly two weeks of attempting to get it working and while some headway has been made, it's still not completely usable. Getting reasonable and timely level of service from the manufacturer has been an exercise in futility. I have now received help from 4 or 5 individuals and they will answer just the very minimum necessary to handle the immediate issue without any consideration for my long-term needs and uses for the device. Needless to say, an incredibly frustrating experience. It's really a shame they aren't willing to just step up and handle all the issues at once instead of me opening multiple support tickets to get all the problems I'm having resolved once and for all. At least resolved to the point where I could have a properly working device. Hopefully it will not be another two weeks until I can really start using the device in the way that was intended. Rated 1 out of 5 by Anonymous from anything but this one i have had absolutely nothing but trouble since day 1. this unit freezes up randomly. you HAVE to set a reboot schedule for it once every 3-5 days. you can NOT just leave it on. I have already had to factory reset it twice. it has frozen twice and corrupted most of my data. it looses connection at random. the android apps are rough to set up and stop working randomly. the online access is spotty at best. stay AWAY from this. i have 16 years experience in the IT field and this is the worst unit i have ever used. Rated 5 out of 5 by Joseph from Whoa! File storage has grown up! For years my photo & Lightroom backup strategy has consisted of redundant HDD in my PC and standalone USB passport-equivalent portable drives. It worked but I wasn't so confident in seamless disaster recovery so I started looking into a NAS for my personal network. I already had a mix of 4 and 2 TB drives, it was the box I focused on. My expectations were minimal - RAID protection and scheduled nightly backups. I received so much more! For many years I've had a Windows-based media solution for movies and music but it was kludgy, mainly because there hasn't been tremendous focus on effective solutions for complete cord-cutters. WMC & XBOX media extenders were getting some rust and my family's frustration with access and playback seemed to have no end. I was delighted to learn that Plex could be installed on Qnap, as well as my preferred solution Emby. Digging further I learned that Logitech Media Server also has (rather, had) Qnap support, so I dug out my old Squeezebox? Touch devices to put together a centralized music solution for home and mobile listening.? But wait - there's more! Virtual machines? Wow. Docker containers? Be still my geeky heart! The list of packages, solutions and capabilities is impressive. I've been involved with computing and IT for almost 40 years, am passionate about automation and I'm lazy - I want to control the world from my smartphone. 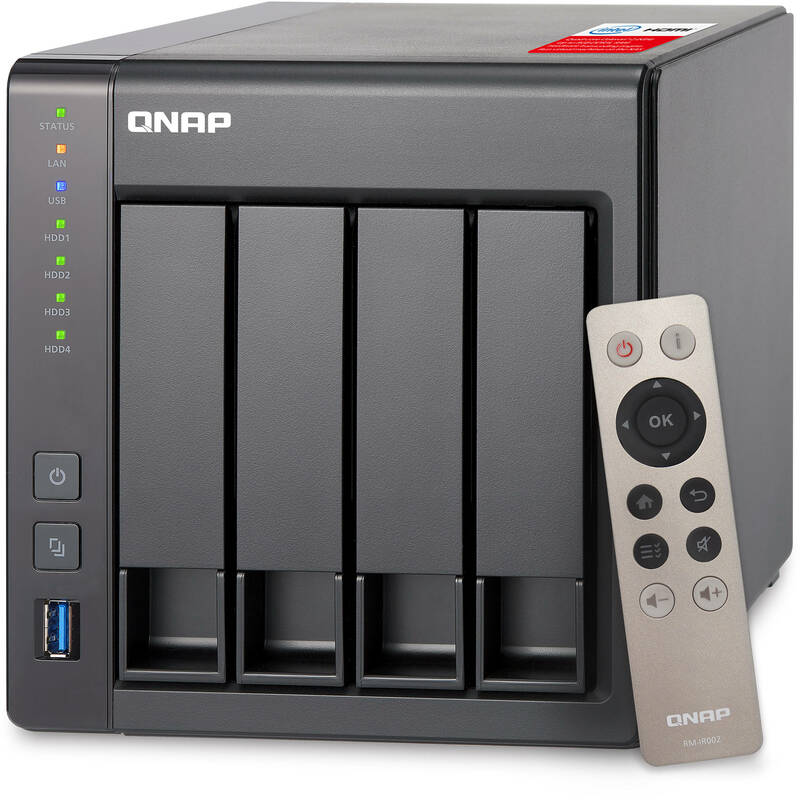 Qnap hits on all cylinders. I couldn't be happier with its capabilities or its influencing a renewed passion to learn more about cloud computing and the many components that Qnap supports. I highly recommend looking into a new SOHO? solution, and Qnap is a great starting point for your research. Rated 5 out of 5 by Anonymous from Good quality and performance Works great with four WD-Red 3TB HDDs. Drives easy to install. Three drives used in RAID5 configuration with one spare. Very quiet operation. Software interface easy to install and use. Any performance experience with raid 5 or 10 (4 hdds) to share? This has functioned very well and meets my needs perfectly. I also like that it works great with my UPS so if I have a power outage it automatically switches to the UPS for power so it can then safely power down (in my area the power can be unstable). It is a bit noisy in the bedroom overnight (not loud but not quite white noise) so I'm thinking of moving it elsewhere. A very minor drawback &amp; not an issue if you have somewhere else to put it. I am a video editor and I use mostly 4k raw footage. I do not have any server I only use Seagate external hard drives, but one of them just broke and I lost about 3tb of data. I am trying to get one of these servers to back up my data but also use it to edit my video out of it. Any suggestions? Thank you in advance!!! I bought the Qnap TS-451+ for just such a reason. It might be a fit for you, but look into other models that might better fit your needs. Hey guys, So is it worth the upgrade to 16gb from 2? So Joshua, If you question is, is it worth upgrading from a single 2 TB external drive to a 4 bay NAS that can hold anywhere from 8 TB to say 32 TB, that would all depend on what your needs are and what you want to accomplish. I am a photographer, am running a raid 5 because I want redundant back up where I can hot swap out a drive should one fail and not loose all my clients imagery. What is the maximum TB Capacity for each and every one Hard Drive acceptable??? Yes. Two slots for DDR3L-SODIMMs. There are a few DIY videos detailing the process.